Authored by yurydelendik on Sep 27 2018, 2:48 PM. Did you check against https://sourceware.org/elfutils/DwarfExtensions to see if this is is available? Is this actually WASM-specific or is LLVM the only implementation and you could use LLVM instead? The plan is to make it non-LLVM specific. There is no registers in wasm. 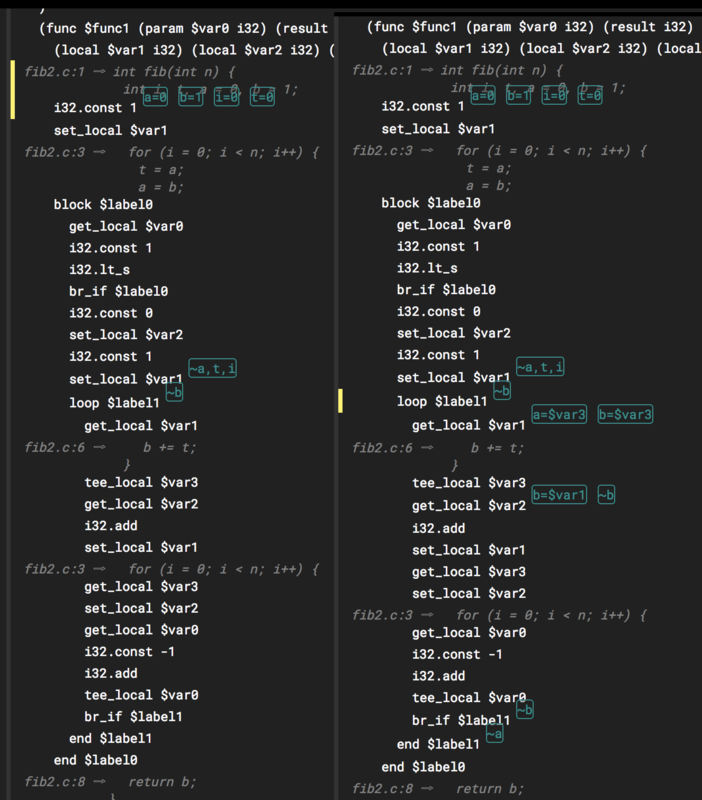 There are (somewhat) unlimited numbers of locals and stack depth per function, globals per module. Maybe there will be more types of elements, e.g.table items? Yes, I entertained idea of complex encoding scheme as <register number> = <type>*3 + <index>. IHMO it is to brittle and does not carry any value, except to be decodable by tools that do not know how to handle it, and at the same time adds a burden to the tools that will know how to deal with and decode that. That's just my opinion. I also found that the tools (e.g. LLVM or LLDB) are eager to know about number of registers (which we cannot determine) to allocate internal structures. Okay, let me try that. It will be sufficient to try it out, since signatures are identical, just spec defined meaning is different (it is not a memory location and offset is not bytes) from what we are trying to achieve, and that's my main concern. I'll make the changes. This is very generic and doesn't really say what it's for, or what any of the fields are for. I get that this is trying to be target-independent but maybe it would be easier to understand if it wasn't. It looks like the index corresponds now to the dwarf register (e.g. to indicate that this is for a local or global), and the offset to indicate which one, but that seems backwards because we use the term "index" to refer to e.g. the index of the global or local. Really what we have might in LLVM terms is a "kind" (i.e. a kind of location, local or stack or global) and an index (which local). "Index" is still a pretty generic term but it does match the usage of the term "index space" in the spec (and I would expect that our numbering should be the same, e.g. 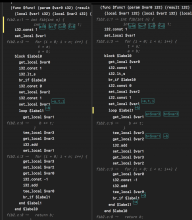 sharing the local index space for arguments and local variables). DWARF leaves a lot of details to the ABI of a platform so I would say it is not uncommon. But since it was mentioned that the indices aren't really offsets I see how using custom operators would be cleaner. I'm not against this approach, I was just trying to point out that an alternative less invasive encoding could be used that might be less confusing to existing consumers of debug information. There will no be existing consumers of WebAssembly debug information, except probably llvm-dwarfdump. Investing time into extension of LLDB/GDB is a risk and may not pay off. The new consumers will be web browser debugger and AOT compilers, which will be familiar with the extensions. I think there will eventually be more consumers, including traditional-style debuggers (even if just for non-web use cases). We could experiment with the register-based approach for now since it wouldn't require coordinating any global numbers or anything. Here I was trying to us existing MO_TargetIndex "Target-dependent index+offset operand" as it is defined in LLVM (similar to lib/Target/AMDGPU/AMDGPU.h). The idea was target-index() will define the (virtual?) location for the local/global/operand, so it is a reference, and it can further participate in DWARF expression calculations using the plus and deref operations if needed. Having target-index() as location/ref may pay-off when structure is stored in a local (e.g. flags) (not sure if it is the case in clang/llvm).